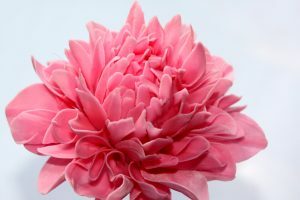 Modern brides are increasingly opting for large, statement blooms to adorn their wedding cakes and the dahlia is one of the most sought-after flowers. 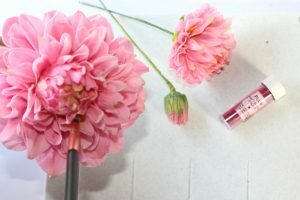 Sugar-floral expert Renata Brocca shares a dazzling tutorial for a beautiful and realistic dahlia flower. 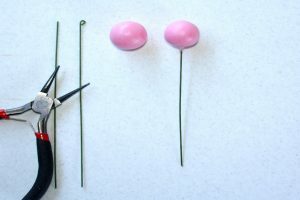 Step 1: Bend a small hook into the end of a 20-gauge length of floral wire. 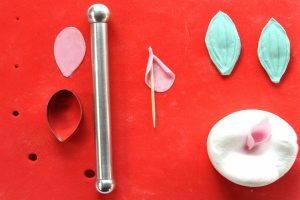 Take a ball of gum paste, dip the hook into some edible glue, and insert into the base of the gum paste. Pinch the paste around the wire at the base to secure. Step 2: Thinly roll out some pink gum paste and using a medium daisy plunger, cut two pieces. 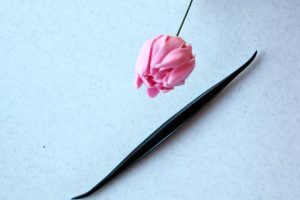 Using a craft knife, carefully separate all the petals of the flower. Step 3: Using a Dresden tool, pinch and vein the middle of each petal as shown. 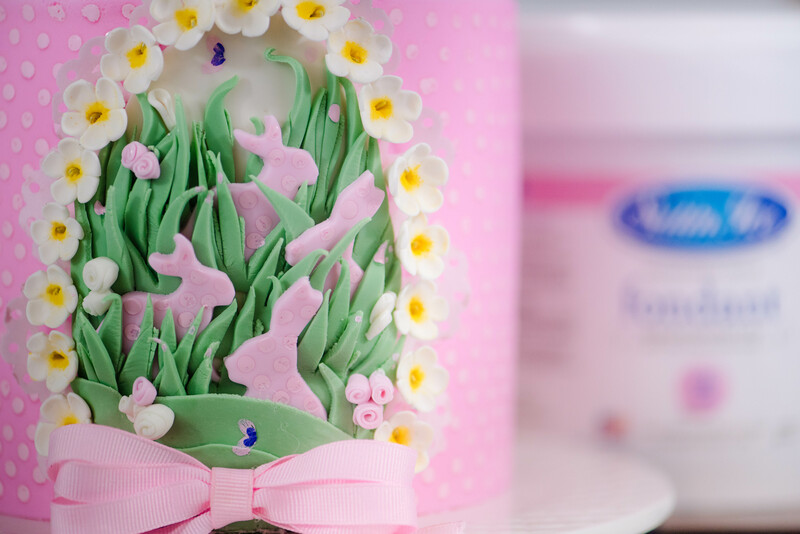 Step 4: Cover the bud you prepared earlier with edible glue and apply the petals around as shown. Repeat to add a second layer. 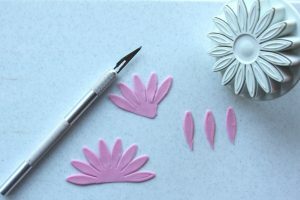 Step 5: Roll out some more pink gum paste and using the smaller cutter from the dahlia set, cut out 14/16 petals. 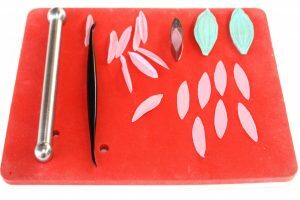 Rest the petals on the foam pad and thin the edges with a ball tool. Use the veiner to add some detail. Next, using the Dresden tool, push outward from the center of the petal to curl and shape the petals. Repeat this step twice. 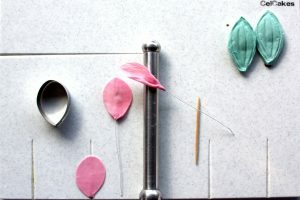 Step 6: To coil the petal, roll a toothpick along both sides of the petal, first on one side and then on the other. Join the two sides together to create a cone shape. 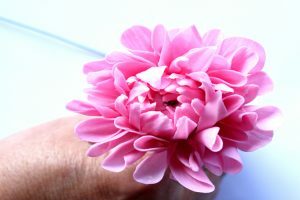 Apply the petal to the center of the dahlia, adding more petals all the way around. 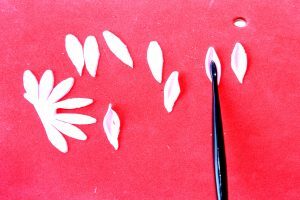 Step 7: Using the second, medium-size cutter from the set, repeat the previous two steps to create 34/36 petals. 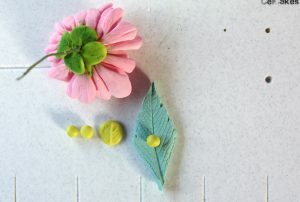 Attach the petals to the flower using a little edible glue to create several rows of petals. Renata notes: Make sure to layer the petals so that they are placed between the previous petals of the previous row. Step 8: The outermost petals will be wired. 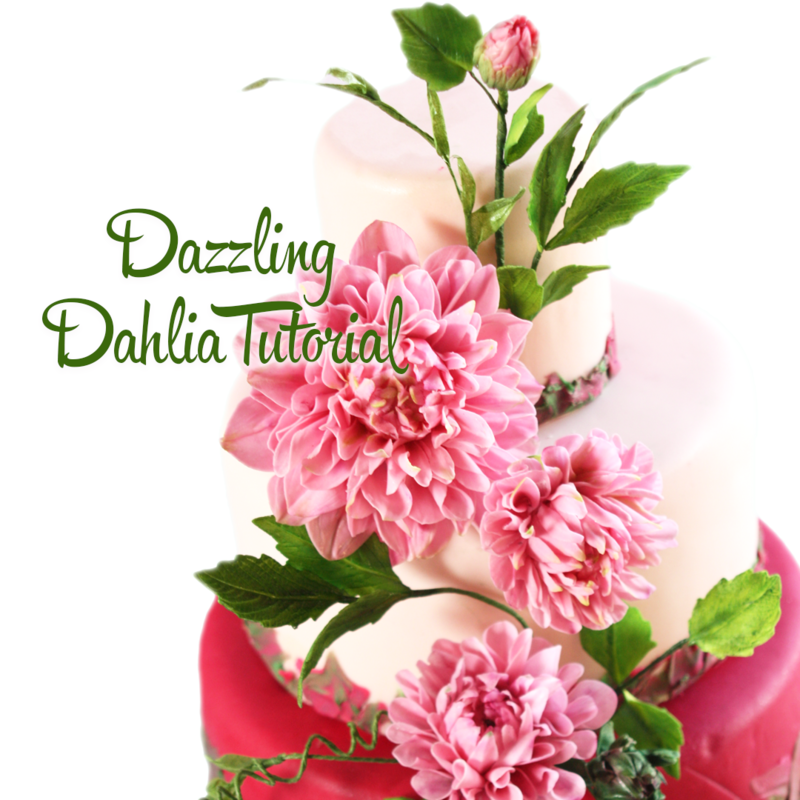 Roll the gum paste onto a celboard as shown and cut out the largest-size dahlia petals along each vein. Insert a 26-gauge floral wire into the vein and secure to the wire. 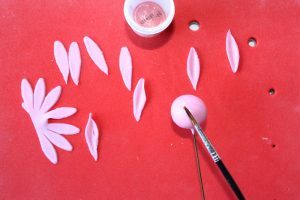 Use a ball tool to thin the edge of each petal before inserting into a veining mold. Add the petal to the dahlia, securing the petals to the central wire with floral tape. 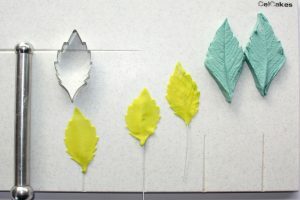 Step 9: Roll some pale green gum paste onto a celboard and using the leaf cutters, cut several large and small leaves. 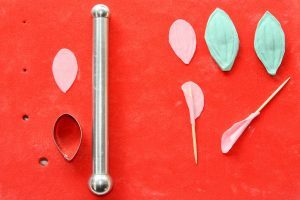 Insert a 28-gauge floral wire into the vein of the leaf, then thin the edges of the leaves with the ball tool and use the veiner to vein the lead. Step 10: To create the dahlia calyx, roll four small balls of light green gum paste and press into the leaf veiner mold as shown to flatten. Use your finger to thin the leaves. Using some edible glue, attach the sepals to the flower. 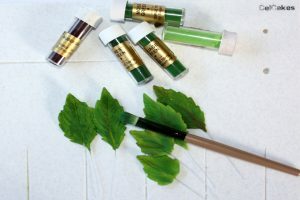 Step 11: Once the leaves are dry, use a selection of green edible dust to layer in color and create a realistic foliage effect. Step 12: Use the claret and plum dusting power to add depth to the flower and to shade the petals on the bloom. 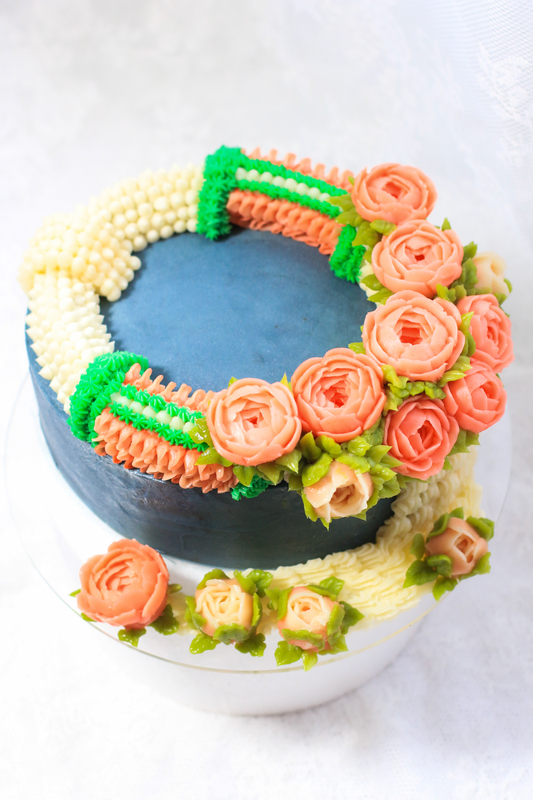 Step 13: To assemble the flower, wire the leaves to the flowers using some green floral tape and place the flowers onto the cake as shown. 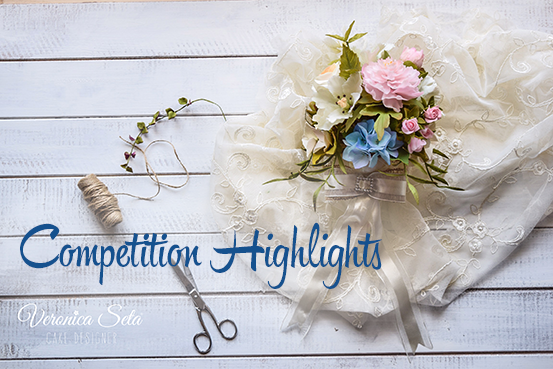 Renata Brocca is an award-winning sugar florist from Naples, Italy. 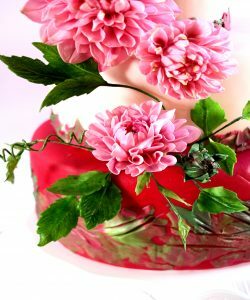 She works at Dolce Mama Cake and specializes in creating beautiful, realistic sugar flowers. 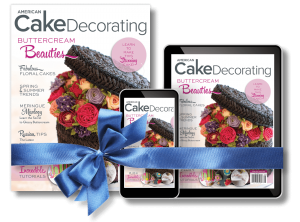 An outstanding sugar-craft teacher, Renata shares her passion and skill for sugar floristry with artists worldwide. 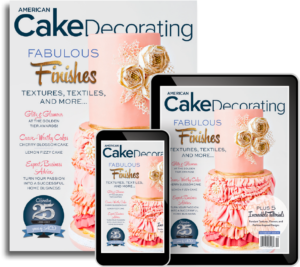 Her work has been featured in many notable cake-decorating magazines.